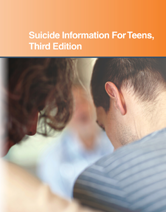 Suicide Information for Teens, 3rd Edition, provides information about suicide risks, causes, and prevention. It discusses mental health disorders and life-threatening behaviors linked to suicide risk; offers suggestions for recognizing suicide warning signs; and explains the most commonly used treatments for suicidal ideation. Chapter 5—Suicide In Older Adults. Chapter 6—Culture Plays A Role In Adolescent Suicide. Chapter 9—Suicide Among LGBT Youth. Chapter 11 —How Is Depression Detected And Treated?. Chapter 12—Dealing With Teen Depression. Chapter 17—Abuse Of Alcohol And Other Substances Increases Suicide Risk. Chapter 23—Why Does A Person Consider Suicide?. Chapter 24—Types Of Suicidal Thoughts And Behaviors. Chapter 29—Medications For Treatment Of Mental Health Disorders. Chapter 35—Coping With Bereavement And Grief. Chapter 36—Trauma And The Grieving Teen. Chapter 38—What Is Mental Health? Chapter 40—Sleep Is Vital To Your Well-Being. Chapter 42—Helping A Depressed Person. Chapter 43—Helping A Suicidal Person.